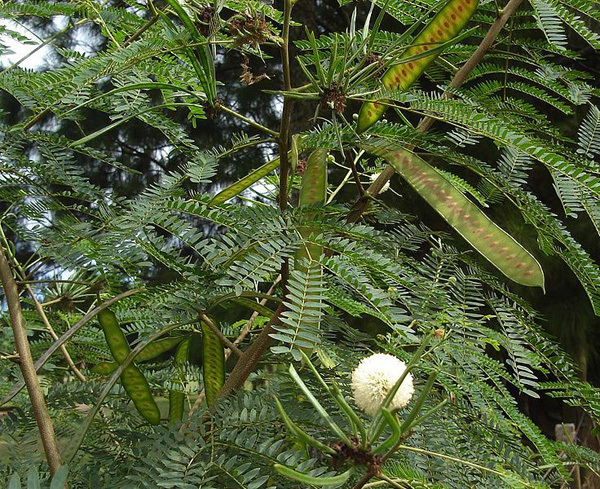 Leucaena is a nitrogen fixing tree with many beneficial characteristics. In the process of researching trees and plants for our tropical food forests, we came across two trees with extremely practical characteristics. Moringa, the third tree we’re focusing on, was covered in previous blog posts. Moringa is considered one of the most nutritious plants in the world and will play a pivotal role in our food forests. “Leucaena is a genus of flowering plants in the subfamily Mimosoideae of the legume family Fabaceae. It contains about 24 species of trees and shrubs, which are commonly known as Leadtrees. They are native to the Americas, ranging from Texas in the United States south to Peru. “Azadirachta indica (neem tree) is a tree in the mahogany family Meliaceae. It is one of two species in the genus Azadirachta, and is native to India, Pakistan, and Bangladesh growing in tropical and semi-tropical regions. Its fruits and seeds are the source of neem oil. Neem is a fast-growing tree that can reach a height of 15–20 metres (49–66 ft), rarely to 35–40 metres (115–130 ft). It is evergreen, but in severe drought it may shed most or nearly all of its leaves. The leaves are also used in India, Pakistan to give baths to children suffering from skin diseases. Elders find it useful in controlling high blood sugar level and is said to clean up the blood. Neem leaves are dried and burnt in the tropical regions of Pakistan to keep away mosquitoes. The neem tree is noted for its drought resistance. Normally it thrives in areas with sub-arid to sub-humid conditions, with an annual rainfall 400–1,200 millimetres (16–47 in). 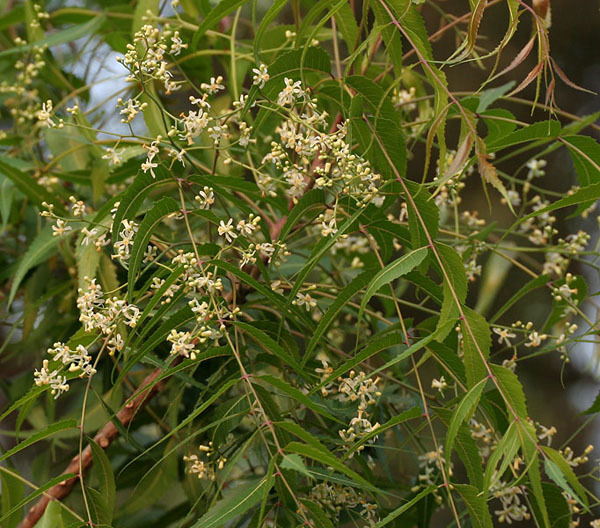 Neem is a life-giving tree, especially for the dry coastal, southern districts of India and Pakistan. It is one of the very few shade-giving trees that thrive in the drought-prone areas. The trees are not at all delicate about the water quality and thrive on the merest trickle of water, whatever the quality. In India and tropical countries where the Indian diaspora has reached, it is very common to see neem trees used for shade lining the streets, around temples, schools & other such public buildings or in most people’s back yards. In many countries such as Ecuador, Haiti and Venezuela the shade is the principal benefit so far commonly attributed to the neem. Neem is considered a weed in many areas, including some parts of the Middle East, and most of Sub-Saharan Africa including West Africa where in Senegal it has been used as a malarial drug and Tanzania and other Indian Ocean states where in Kiswahili it is known as ‘the panacea’, literally ‘the tree that cures forty diseases’. The tender shoots and flowers of the neem tree are eaten as a vegetable in India. Young neem leaves are fried in oil with tiny pieces of eggplant. Neem gum is a rich source of protein. In Myanmar, young neem leaves and flower buds are boiled with tamarind fruit to soften its bitterness and eaten as a vegetable. In India, the plant is variously known as “Sacred Tree,” “Heal All,” “Nature’s Drugstore,” “Village Pharmacy” and “Panacea for all diseases”. Products made from neem trees have been used in India for over two millennia for their medicinal properties: neem products are believed to be anthelmintic, antifungal, antidiabetic, antibacterial, antiviral, contraceptive and sedative. It is considered a major component in Ayurvedic and Unani medicine and is particularly prescribed for skin disease. Neem is a key ingredient in non-pesticidal management (NPM), providing a natural alternative to synthetic pesticides. Neem seeds are ground into a powder that is soaked overnight in water and sprayed onto the crop. Neem does not directly kill insects on the crop. It acts as an anti-feedant, repellent, and egg-laying deterrent, protecting the crop from damage. – Neem oil is used for preparing cosmetics such as soap, neem shampoo, balms and creams as well as toothpaste. – The neem tree is of great importance for its anti-desertification properties and possibly as a good carbon dioxide sink. – Lubricants: Neem oil is non drying and it resists degradation better than most vegetable oils. In rural India, it is commonly used to grease cart wheels. – Fertilizers: Neem has demonstrated considerable potential as a fertilizer. Neem cake is widely used to fertilize cash crops particularly sugarcane and vegetables. Plowed into the soil, it protects plant roots from nematodes and white ants, probably due to its contents of the residual limonoids. – Honey: In parts of Asia neem honey commands premium prices & people promote apiculture / apiary by planting neem trees. Leucaena looks similar to the kratin tree we have here in Thailand. Yes, that’s it. Leucaena seems most popular in Australia from the little research I’ve done.